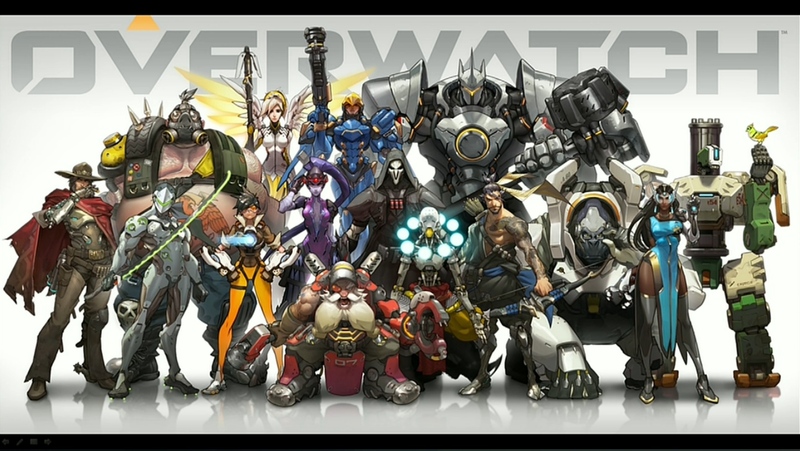 I was fortunate enough to be at BlizzCon when Blizzard announced their new game, Overwatch. Even before they showed the cinematic trailer, I felt something rise in my chest. I wanted it to be a superhero game. A good one. It's a multiplayer shooter, so it plays very much like Team Fortress 2. Which is fine, in and of itself, but it wasn't the superhero game I wanted. Which is weird, because the roster of characters reads very much like a superhero game. This is the line-up of the first fifteen characters. Currently, they've shown 12 of them in-game. The cinematic trailer itself shows many more characters. So, I was excited by the game, but now wish it was so much more than what it actually is. Oh well, at least it inspired me to create some Zodiac Overwatch in the City of Heroes costume creator. Ubisoft: "Women Are Too Difficult To Animate"
Blizard: Here's 5 playable women characters and a gorilla with glasses. You're welcome. I do like the ideas and designs of the characters. It holds that comicy feel to it that should appeal to people - espeically now in this age of all things comics. I'm a little disappointed that everyone seems to be tech oriented. Reaper's Ultimate Ability looks awfully familiar. I don't know why Blizzard gets to use a sentient robot named Bastion when we had to change ours to Citadel. I'M NOT BITTER OR NOTHING. Every one is tech because of the near-future setting in the "real world". They are staying away from fantasy and magic, that belongs to Warcraft. Although, an argument can be made that Winston is super-science. And there's definitely something mystical about Zenyatta and Hanzo. I love the idea of Zenyatta, a Zen monk android. Like I said, I made some Zodiac Overwatch. But, I didn't follow the official uniform colors. As I used blue, white and gold a lot. Like a whole lot. 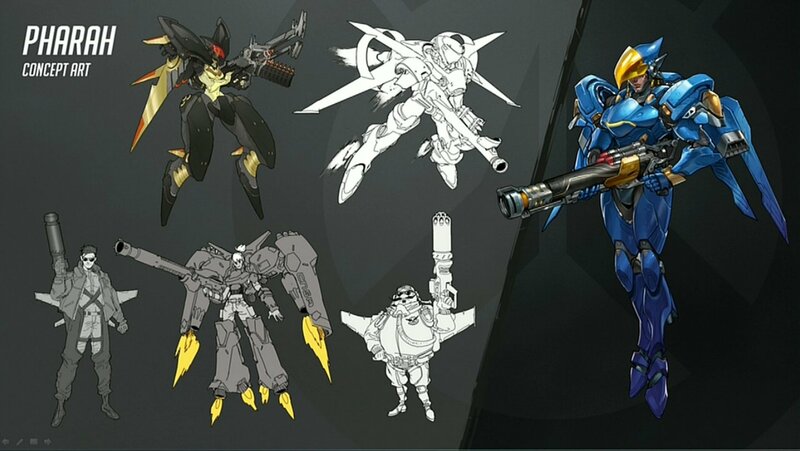 Still, it looks that the heroic characters in Overwatch are all uniquely designed anyway. With maybe the uniform guys as only common troopers, e.g. grunts. The character designs to vary widely, like any good superhero team should. I figured it was a deliberate decision and that alone wouldn't keep me from liking things. I do like my variety though. Thanks a lot Justice League and Avengers. Overwatch sort of reminds me of that supergroup ULTRA where it was human normals only and there was a lot of tech-tech reasons for the different abilities. Despite my only critique against the all-tech origins, I love the diversity in character designs. I'm partially excited as it seems like it's really built around teamwork and adaption. The ability to switch out to a new character after death seems like it's designed to allow your team to adjust to counter theirs or to mix up strategies mid game to keep them guessing. I've never played TF2 but am going to be keeping an eye on this. Minor critique! The boots you used for Reaper don't mesh well with other costumes. You can see a gap at the knees. I might never have ever noticed if I hadn't used them myself if I hadn't tried them on my time traveling Widow. I don't think I can do either Bastion or Rheinhardt justice, unfortunately. My son got it for his birthday. He was enjoying it, even if half the time he barely knew what was going on.